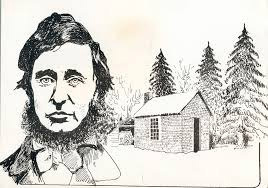 Thoreau whose birth anniversary we mark on 12 July was not a systematic writer but rather one whose thoughts came in flashes of light in response to specific events. While his book Walden is the best known, it is his short essays that have had the most lasting impact, in particular “Civil Disobedience” and “A plea for Captain John Brown”. In these two essays, Thoreau places himself squarely in the tradition of radical protest with his faith grounded not in political theory but in the principled individual. It is to the revolutionary act based on the principled individual that attracted Mahatma Gandhi to Thoreau and this essay on civil disobedience. Time and again, Thoreau celebrates the principled individual as the source of good, of the genuine patriot. Thoreau, however, was not only for non-violent action as in his choice of going to jail. He also understood and in some ways approved individual violent action based on principle as expressed in his plea for John Brown. Thoreau had remained distant from the abolitionists who were working for legislation to abolish slavery. Many of Thoreau's friends were among the abolitionists, but Thoreau had little faith in legislation to bring about reforms. In 1857, in the Dread Scott decision, the US Supreme Court decided that Congress could not prohibit slavery. Thoreau was strongly against the institution of slavery and an economy based on slave labor. Thus, the individual action of John Brown, even if violent, appealed to him. In 1859, some sixteen months before the start of the Civil War, John Brown, his sons, and 19 men attacked the U.S. Federal Arsenal at Harper's Ferry in Virginia. There were about a half-million slaves in Virginia in 1859, and John Brown thought that they would rise up. They did not, and very quickly Lieut. Col. Robert E. Lee and a few soldiers killed Brown's sons and later Brown was hung with six of his men for treason. Quickly Robert E. Lee went on to become a general and to lead the Confederate forces in the Civil War. Thoreau said Brown would live beyond death, a theme taken up in the song “John Brown's Body” − a moldering in the grave but the soul goes marching on. The individual, as John Brown, with unshakable belief in his own virtue and as an agent of Divine retribution is still with us today, called martyr by some and terrorist by others. Thoreau's emphasis on individual principled action is still an issue for serious consideration today.